Spokane Valley, nestled on the eastern border of Washington state, is a community focused on the growth of its residents. Incorporated on March 31, 2003, the newer city takes a progressive approach to problem solving and is committed to providing individuals and families with opportunities to live, work, play, and flourish in this ever-growing community. With a population of over 92,000, Spokane Valley promotes activities and programs aimed at supporting its growing homes and families. With a focus on the future, the growing community works collaboratively with citizens to encourage a sustainable growth that will benefit all of its current and future residents. 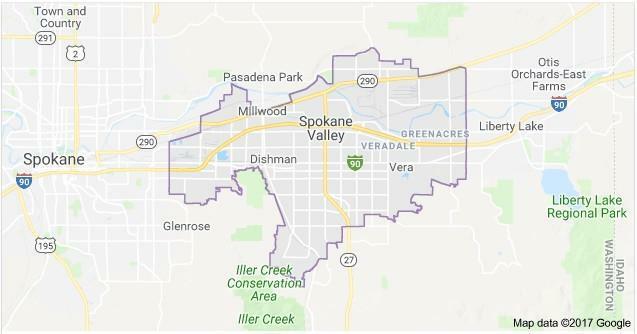 If you are considering a move to the Spokane Valley area, contact a Spokane Valley real estate professional. Nancy Wynia has worked with countless home buyers relocating to the Spokane Valley area. For more information on area homes, contact Nancy Wynia today. The city of Spokane Valley is committed to providing its residents with top-notch schools, neighborhoods, and a thriving economy that encourages growth. The city's friendly community and beautiful surroundings harmoniously meld and create an atmosphere unlike no other. The recently incorporated city encompasses nearly 40 square miles, which includes many wonderful areas for Spokane Valley residents to enjoy a wide array of recreational opportunities. - East Valley School District - over 4,000 students and eight schools. - Central Valley School District - 13,000 and 23 schools. - West Valley School District- nearly 4,000 students and ten schools. Spokane Valley is located in a region that invests heavily in the education of its youth. The highly skilled workforce of the Spokane Valley is a direct result of the community's commitment to its students. The area's schools have been nationally recognized for their commitment to excellence, and area students are often encouraged to engage in challenging coursework that will prepare them for the future. Within the region, 14 public school districts collaboratively serve the needs of area students. Of the region's total students, over 6,000 take courses in AP, honors, and Running Start Programs. The city of Spokane Valley is invested in providing an unmatched quality of life to its citizens. As home to the CenterPlace Regional Event Center, the Avista Stadium and the Spokane County Fair and Expo Center, the City is invested in meeting the many needs of its residents. The CenterPlace at Mirabeau Point in Spokane Valley offers 54,000 square feet of space for regional and community gathering. The facility features a great room/banquet hall, numerous rooms for meetings, and a state-of-the-art lecture hall. The Spokane County Fair and Expo Center also offer space used for hosting a variety of shows and events throughout the year. Trough the various facilities maintained by the city of Spokane Valley, residents are able to participate in and enjoy a wide array of entertainment. From lectures to musical events, entertainment in Spokane Valley is sure to offer something to everyone. Spokane is home to a minor league baseball team known as the Spokane Indians. The team's home, Avista Stadium, is located just within city limits and can seat 7,200 fans and spectators. The Spokane Valley area offers many opportunities for outdoor recreation and enjoyment of leisure activities. The city is home to three city pools, seven miles of the Centennial Trail, and eleven city parks. With over 180 acres of parks and open space, the city strives to support the community through provisions that promote quality recreation areas, facilities, and programs. The area known today as the Spokane Valley was originally populated by the indigenous tribes of Coeur d'Alene and Spokane. The native tribes were attracted to the area's many natural resources of abundant animal, plants, fish, and potable water. It is these natural same natural resources which attracted settlers the area in the mid 1800s. The first settler of European descent to arrive in the area was Antoine Plante, a French-Canadian-Gros fur trapper who worked for the Hudson Bay Company. Plante settled on the banks of the Spokane River in the Spokane Valley around 1852. Always enterprising, Plante traded livestock, trapped, hunted and acted as a guide to the Territory's Governor Issac Stevens' surveyors. As more people moved into the region, Plante operated a ferry to help settlers cross the river. During the later part of the 19th century, many settlers established, orchards, farms and trading posts within the area. Irrigation, increased the productivity of the area's crops, and until 1925 apples were a mainstay of Spokane Valley's economy. Throughout the years the area of Spokane Valley grew, always changing with the times. During the last half of the 20th century the area transformed itself by fostering a more suburban lifestyle. In 2002, the Spokane Valley was officially incorporated as a 37-square-mile city, becoming the 9th largest city in Washington.